It was a chilly, clear night Saturday, Nov. 24, as the annual Parade of Lights illuminated the village streets in Blissfield. Lane Street and Giles Avenue were lined with people gathered for the lighted event which included everything from a lighted sousaphone in the Blissfield High School marching band, to a giant reindeer driving a float covered in Christmas lights. 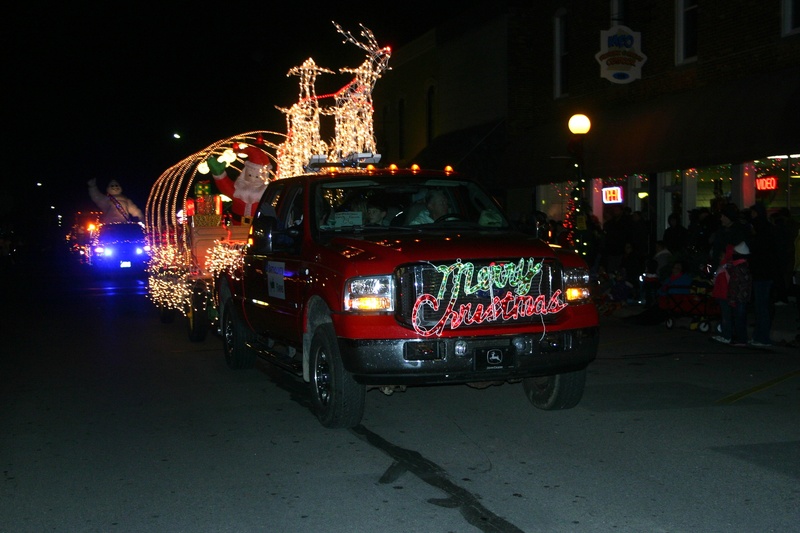 Lighted tractors, floats, cars, trucks, firetrucks – even a motor home – made their way along the parade route ahead of Santa and Mrs. Claus in horse-drawn cart. The parade was sponsored by Blissfield DDA/Main Street Program and presented by Blissfield Coney Island and B-Town Bar & Grill. Copyright 2012, River Raisin Publications, Inc. Photos by Melissa Burnor. For more from Melissa Burnor and Chad Hutchinson on the parade, please see the Nov. 28, 2012, edition of The Advance. To subscribe for weekly home delivery, please call 517-486-2400.